Erin Fallis (’12) with members of the U.s. Army’s healthcare recruiting team. 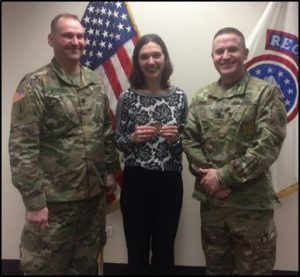 Erin Fallis (’12) has received a commission to become a U.S. Army Second Lieutenant and will be the first recipient of the military’s Healthcare Provider Scholarship Program (HPSP) for midwifery. After completing her Doctor of Nursing Practice and becoming a midwife, Fallis will begin her eight-year obligation to the U.S. Army – the first three of which must be on active duty. The remainder may be satisfied through reserve service. Fallis says she came to this unique position by combining two passions – a love for working with veterans (her husband is a veteran and she currently works for the VA) and midwifery. With her husband’s help, they sought out options with a military healthcare recruiter and after a one year process, all is set. Learn more about the HPSP.